Most of the students have been participating a vast of your upcoming examinations. We thought of helping you by giving out daily current affairs quiz on banking, insurance and other examinations that will boost up your mind and prepares for the various exams and it helps to crack a lot of examinations. The current affairs and quiz contain mainly excepted questions which match with the exam pattern for the Government job exams and bank exams. 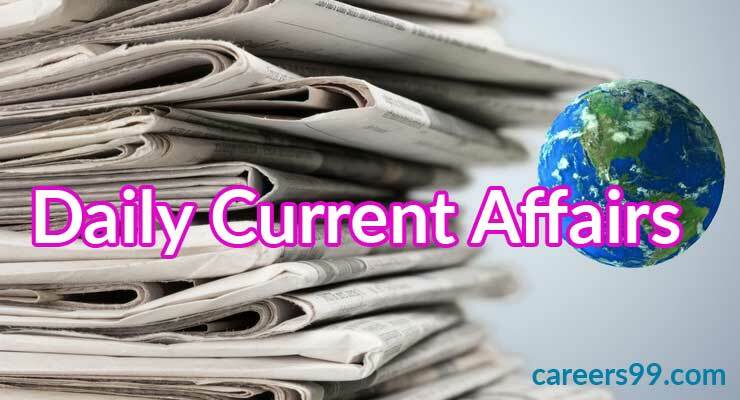 We pushed the current affairs quiz August 3rd 2018 and check the preparation level. By checking the current Affairs today you may also check the yesterdays Current Affairs Quiz and try to attempt 20 bits correctly. The top 30 teams from the online submissions on ‘movehack.gov.in’ and they will travel to Singapore for two days (1st & 2nd September). In Abdul Kalam Island, Odisha DRDO organized successfully by conducting the test of Ballistic Missile Interceptor (Advanced Area Defence). The endo-atmospheric missile, capable of intercepting incoming targets at an altitude of 15 to 25 km was launched against multiple simulated targets of 1500 km class ballistic missile. Surya Prabhu Commerce and Industry Minister successfully launched a logo and tagline for GI (Graphical Indications) to improve awareness in the Intellectual Property rights in the country. The main slogan for the GI is –‘Invaluable Treasures of Incredible India’. The Worlds First Hindi Speaking Humanoid Robot is developed by a Ranchi Based Software Developer Ranjit Srivastava and he claimed to cost for 50,000/-. Jalees Sherwani who had written lyrics for several films like Dabangg, Wanted and Tere Naam, passed away. He had 70 years old. Aside from penned dialogues for Sangam and Loafer, Sherwani also wrote lyrics for films like Partner, Hello, Garv and Hello Brother. For the year 2013-17 the President Ram Nath Kovind gave the Outstanding Parliamentarian Award in New Delhi. This Award was perceived to Best Parliamentarians. The Award Winners are listed below. This year according to the Morgan Stanley Report the Indian’s Economy was expected to GDP growth of 7.5%. Mauritius-based SBM Group has received Reserve Bank of India’s approval to operate in the country through a wholly-owned subsidiary route. It is the first foreign lender to receive such a licence after local incorporation was introduced in 2013. NABARD sanctions 772 crores for 8 water Projects in rural places of Haryana as per the State Minister for Public Health Engineering Banwari Lal said. France’s Parliament has signed into law a controversial asylum and immigration bill to accelerate asylum procedures by cutting the maximum processing time to 90 days (current 120 days) after entering France.